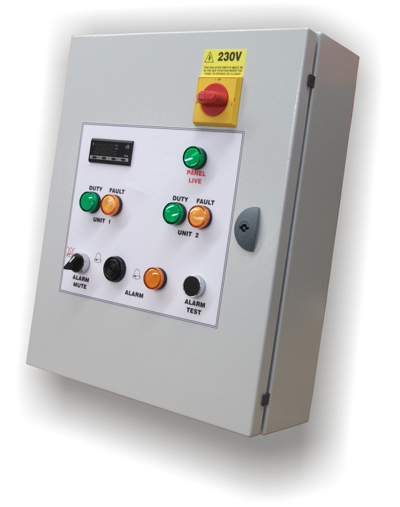 Our duty share control panels are designed to meet your requirements controlling up to six air conditioning units in any configuration. We can also incorporate an auto dialler which will send you a message on unit fault. If the duty unit sends a fault signal to the panel, the fault indicator lamp will illuminate and the panel will switch on the standby unit, the volt free fault contacts will make, the audible alarm will sound. The control panel is also designed to monitor the room temperature, if the room temperature rises above the set point both units will run, the volt free fault contacts will make, the audible alarm will sound, when the temperature drops below the set point the panel will go back to normal operation. The control panel is designed for wall mounting in a clean, dry environment where the ambient temperature does not exceed 30°C. A space approximately 50mm should be left around the enclosure to allow for heat dissipation. Fix the enclosure to the wall using proprietary fixings. Remove the gland plate then drill and gland for necessary cable entry and exits. Replace the gland plate and wire panel in accordance with the wiring diagram. Have a question about Sarum Duty Share Control? Please fill out the form below and we will get back to you.